From Julie Brydon of Los Angeles, California on 8/28/2010 . The cupcakes I made with this mix not only wowed me, they also got the stamp of approval from two carnivores and a vegetarian. I will be buying this again! From Kuntal Joisher of Mumbai, India on 10/3/2008 . Absolutely fantabulous!!! I have never eaten such an awesome chocolate cake in my life. Yumm!! From Richard Natoli-Rombach of Rochester, New York on 6/18/2007 . A rich very, very chocolate cake. Almost a cross between a brownie and cake. A small piece of this is all you need for a chocolate fix. From Anonymous of San Antonio, Texas on 11/1/2006 . 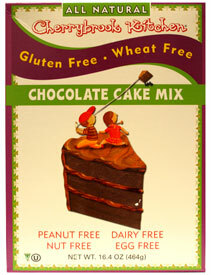 We love this cake mix, and it's sweet enough (with the little chocolate chips in it) that it doesn't really need frosting. Just be aware that one package only makes one layer of a 9" cake, or 12 cupcakes.